We don't live in the prehistoric age. Dinosaurs don't exist anymore. So why did Steven Spielberg kill a triceratops? 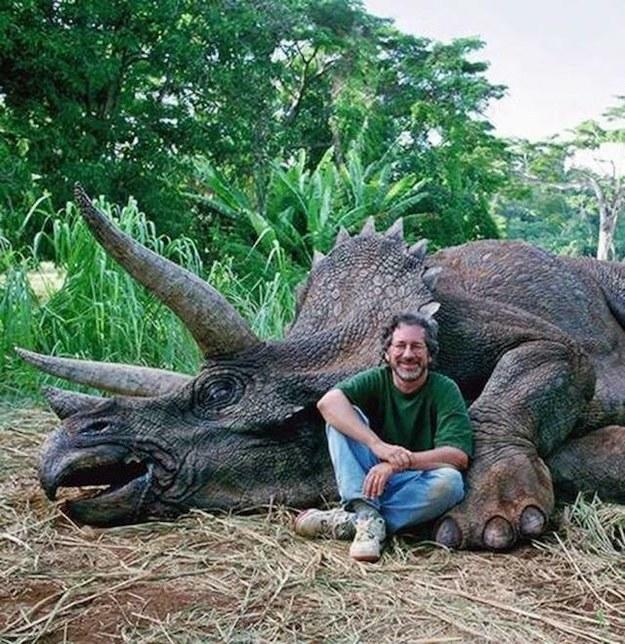 Turns out lots of non-"Jurassic Park" fans on Facebook didn't realize that Jay Branscomb was joking when he posted a "disgraceful" photo of a "despicable man" — namely director Steven Spielberg — posing with a poached triceratops. It's been shared over 30,000 times! One Facebook commenter who was in the dark about the animal's extinction wrote, "Disgusting! I bet he only kept the horns!" Earlier this month, a Texas cheerleader uploaded pictures from an actual hunting trip in Africa on Facebook. Kendall Jones caused an uproar, beaming next to animal carcasses. Those game pics were aptly removed by Facebook. As for Spielberg's still from the movie shoot, it's still going around social circles. So, is common comedic sense extinct? Share your thoughts with us on Facebook or Twitter.